Easter is March 31st this year so it is fast approaching! I am making the turkey this year and since my mother-in-law who is a cook straight from heaven normally makes the turkey, I knew I had to kick my 2013 Easter turkey up a few notches! As I pondered on how I would do this, I thought about how much I love Roasted Peruvian Chicken and then it hit me BAM POW KABOOM! I am going to make a Peruvian Turkey, treat it very similar to my Roasted Peruvian Chicken recipe by way of flavors but with a Holiday Turkey flare! The next step would be to find the perfect Roaster! After all the equipment in the kitchen can sometimes be just as important as finding and combining the right ingredients in an incredible recipe! After reading many different roaster reviews on-line I decided to try the Calphalon Nonstick 5-Piece Roaster Set since quality seemed to be the prominent response on most of the reviews I read. Let me share with you how it worked out for me! 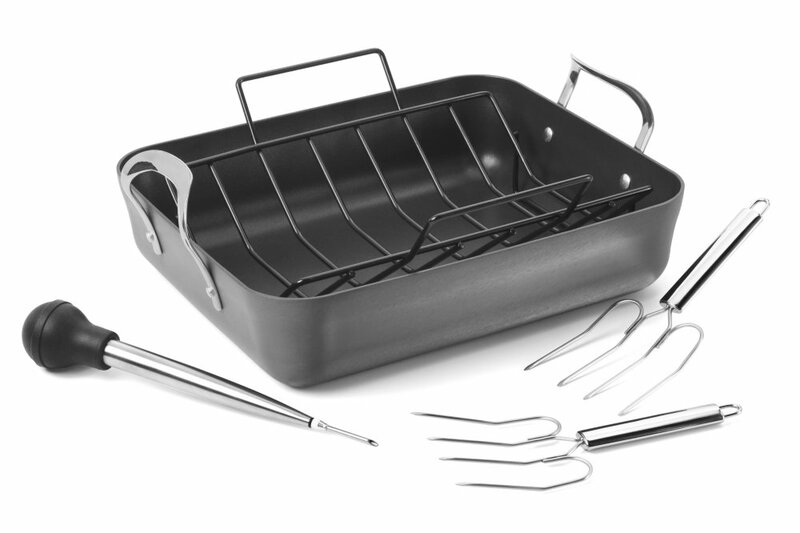 I love love love my Calphalon Nonstick 5-Piece Roaster Set it comes with the roasting pan and U-shaped rack along with with two lifters, and a baster that also has a tip attachment so it could also be used as an injector as well. Of course I was way excited about that because the more flavor I can infuse the better! I also love when products come with Life Time Warranties. 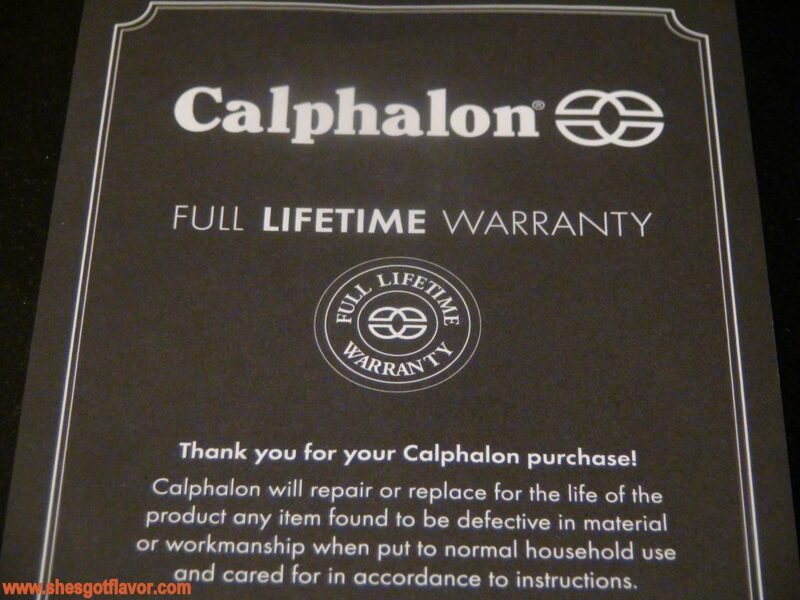 It makes you feel as though Calphalon cares about its customers and the products they manufacturer! It also makes me more comfortable in trying new products for the first time. Everyone wants to know that a company stands behind its’ products!! After checking out my roaster and tools, I was ready to take on my Roasted Peruvian Turkey!! Watch out – here comes the Easter flavor!! CALPHALON IS GIVING ONE OF SHES’ GOT FLAVOR READERS A FREE 5-PIECE NONSTICK ROASTER SET FOR EASTER! ENTER BELOW FOR YOUR CHANCE TO WIN (US Residents only)! As you enter, don’t forget after you’ve taken the 3 required steps the remaining 5 optional steps count as additional chances to WIN WIN WIN WIN WIN! Disclosure: I received products reviewed, however, all opinions are that of my own. My Easter contribution is the holiday ham with all the trimmings; and it goes without saying that my signature homemade carrot cake with creamed cheese icing is always a menu favorite. I am going to do some different Easter side dishes this year. But still going to cook my ham the same as always! Baking a ham and adding some new sides to our typical easter menu. Looking for some new recipes as I type this. My husband is planning on frying a turkey this year! I think I’m going to attempt to add a few new sides to dinner for Easter this year. I might be on the road for Easter so I’m not sure what kind of dinner I’ll be having! I don’t know yet – too early for me to have that figured out. With birthday cake! My birthday falls on Easter this year! Going to family’s for Easter dinner. using only organic meats, cheeses, and veggies! Too early to think about Easter dinner. Absolutely, Ham with Apricot glaze! I don’t plan that far in advance! Been looking at recipes, but no decisions made yet. No plans have been made yet, but usually Easter is spent with my children/grandchildren at their house. The star of the meal is generally ham and I suspect this year will be the same. Lots of homemade sides with a brined roasted turkey! I’m going to be marinating a ham with a new recipe that calls for honey, mustard and citrus – Hope it turns out well! If it doesn’t, I at least hope no one tells me it’s bad! For me, holidays are all about dessert! For Easter we skip the traditional ham and do prime rib covered in horseradish. I’m adding bacon to a few dishes to add a new twist to some old favorites! BBQ, crawfish and I will be bringing the sides! 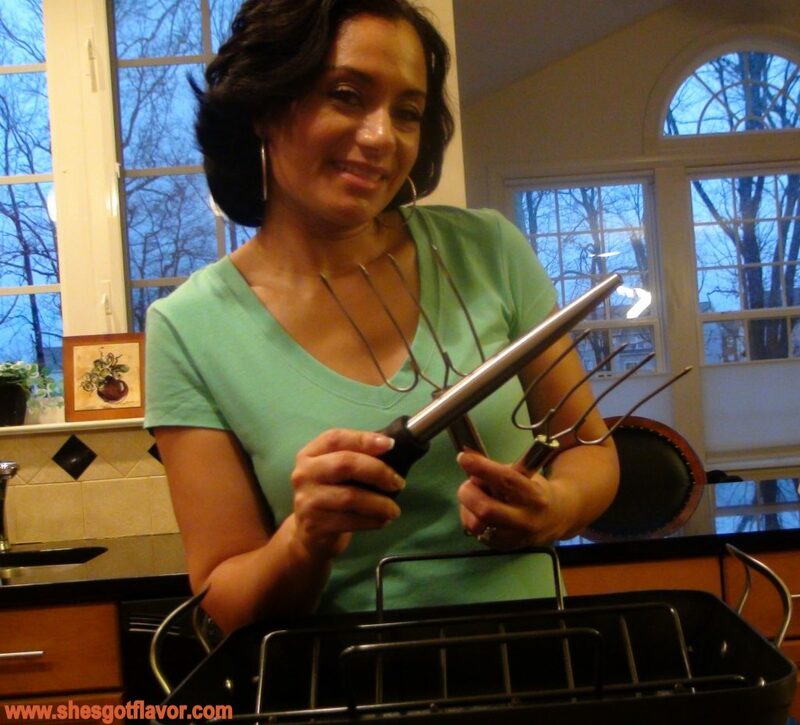 I will be making a chicken, sides…and desserts! Can’t wait! Thanks! I am going to be at my in-laws, but I would love to offer to make the turkey next year with this set! I don’t cook it, and not sure what friends are doing. I am going to try something new with the ham with ginger ale and peaches. We’ll be having lots of garlicky, gingery vegetables. We are making lots of food from scratch like home made raviolis and Easter Pizza. I’m actually not making Easter dinner this year, we are going to my in-laws. But I’m hoping we’ll have ham and carrot cake! Will start with Han and Turkey and all else will follow. Ham and all the trims. I’m the BIG COOK of the family and really enjoy it. We will be cooking a ham this year, was going to try to add some brown sugar and pineapple! our family always has an amazing ham on Easter! Easter is on my birthday this year!! But, my husband has to work!! We will probably have a meal with family on Saturday. I’ll probably be making a ham and all the traditional sides. I would love to pan to help with Easter cooking! My family has requested I make the She’s Got Flavor ‘Smack Yo Momma Ribs’! and I’ll give them some extra love with the Pineapple Cheesecake Cupcakes. Yum!